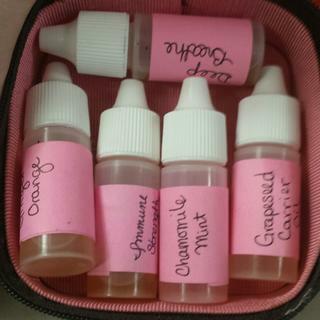 These little blending bottles are a great value for those who travel or like to take their oils with them on-the-go. I always keep a few small bottles of my favorite blends and some extra carrier oils in my purse and never have to worry about leaks or the bottle breaking, like I might worry about with the larger bottles. I ordered these bottles so I can do my own blends. It is actually smaller than I expected but it worked just fine and in fact ended up being a good size for me since it fits everywhere. Just unscrew and blend your favorite EO. Very satisfied. I have purchased essential oils, a carrier, and blending bottles. I have been extremely happy with not only the products and their quality but all the customer service and follow up information on their products and their use. I am happy with all my orders thus far. Perfect size for taking some base oil to blend with other essential oils when I go on trips. This was my first time to order from RMO and I have been pleased all around. The oils seem to be of great quality, it was easy to shop, learn & place my order online, and I received my order in a reasonable amount of time. Will be recommending to others. These work great! My only problem is not knowing what to make to fill this valuable space! Perfect for making a small blend to sample. Have not had a chance to use it yet but was very happy with the service I received. Will rate my order at a later date. As always, RMO's customer service is above any other online company I've ordered from. After just had a horrible experience with Toshiba and their terrible customer service where I was on hold for over 10 minutes then the overseas call center kept repeating their script but never actually helped me with my issue. It was very frustrating. I'm glad that their are businessA like RMO that still value their customers. I would not go anywhere else for my essential oils. nice bottles, work well, will order more. I am going to write a review for all my oil purchases. I am starting to "get the just" of using them. Trying to research and do my best. With so many questions my biggest is, is there a page on your site of different formulas that one can use? That is were I am having trouble, creating formulas correctly. Perfect size for blending small amounts to put in a roller bottle. I need other items I do not have with me here in AZ so I have not used it yet. I mostly use them for sharing these incredible oils with friends. They are great for making a quick blend to keep on hand or take with you. I actually keep one in my sons drawer for quick access. I purchased this bottle to fill with olive oil which I frequently used as a carrier oil for my essential oils. It is a nice size and fits in my essential oils carrying case nicely. love these to make blends to use and share! Perfect size and easy to use. Love! These blending bottles are great for mixing my own blends. Great to use, easy to clean and work well. I like these for blending because I can get nice, even, controlled drops out of them. These bottles are terrific to have on hand. But RM when you ship them please don't tape them all together. That sticky residue is very hard to get off of plastic. When trying to dispense the oil (after blending), the tip is so small it is difficult to get anything out of the bottle. I realize it would be so easy to make the tip a little larger (by sticking a sharp pointy object in), but then if I get it too big, well I've ruined the bottle. So it just takes a little patience to get the flow moving is all. I've only used Rocky Mountain Oils. They're awesome. The plastic blending bottles are an inexpensive way to have a mixture on hand. Though it would be easier to mix if the mouth of the bottles were larger. I have several and I like that you can see exactly how much oil is left in the bottles you've filled. I will probably buy a few empty glass bottles and use the plastic ones for travel. Love these little bottles for making blends and carrying carrying with me. Sometimes I'll need to use a blend for a couple of days and this is the perfect size bottle. It's very tiny and does not come with any instructions. I do not know how to get oil into this tiny bottle. It is much smaller than the glass bottles. I didn't even use it because the bottle is a closed system and there were no instructions on how to use it. Are these reusable - can they be washed with regular soap and water so that you can use them again with a different mixture? BEST ANSWER: Great question! You can rinse them with soap and water or with FCO to clean them and reuse. Are these bottled PET plastic?